When moving through my day with all-American speed, buffeted from one stress to another, I sometimes feel my inner self begin to curl up within, withdrawing from the world in self-protection and preservation. If this feeling persists over time without an opportunity to regain my inner composure, I begin to wonder if I’ve forgotten how to live big, how to move through life with a sense of substance and vitality. When this happens, I know it’s time to head straight to my mat, inviting yoga’s vast steadiness to counter feelings of smallness within. The magical blend of movement, meditation and mindful breathing helps me stretch out into my true self, reinvigorating my life with a refreshing sense of possibility and joy. There’s something magical about yoga that nurtures the courage to move boldly in the direction of our dreams instead of settling into a shriveled-up version of ourselves. Paripurna navasana, or boat pose, can teach us lots about living big. This challenging posture cultivates determination, stamina and boldness of spirit. It also builds strong and steady muscles in the body's core, fosters a satisfying sense of vigor and warmth, and offers a healthy dose of substance to propel us through our day. When practiced with gusto, boat pose can be one of the most empowering postures in all of yoga. To begin, sit on the floor with your legs outstretched in dandasana, or staff pose. Take a few moments to consider how your pelvis is positioned on the earth beneath you. Is your tail tucked under, causing your weight to drift back onto your sacrum and your lower back to round? Or are you sitting firmly atop your sitting bones (those two bony, coin-sized points at the very base of the pelvis)? As much as possible, shift your weight forward to rest squarely on the sitting bones, with the lower back drawn inward into a more neutral position for the spine. At the same time, invite the heart to rise upward and the shoulders to soften, so your spine feels long and spacious. When you've found this light and uplifted feeling in your torso, bend your legs and slide your feet toward you until they rest on the ground a few feet in front of your hips. Notice what happens to the spine as you do this. Do you fall back onto your tailbone, lazily collapsing the lower back? Or are you able to maintain a long spine and a bold, uplifted heart? If necessary, shift the weight of your body forward again onto the sitting bones, reestablishing a firm and steady foundation for the exploration ahead. While keeping your shoulders as relaxed as possible, reach your hands around the outside of the legs and grab hold of the backs of the thighs. Use the legs as leverage to help pull your lower spine inward and upward toward the sky. At the same time release the shoulders downward, fostering a sense of ease and spaciousness in the neck and upper back. To be clear about this action, you might try rocking back onto the sacrum at the base of the spine and then forward onto the sitting bones a few times. Notice how as you rock back onto the sacrum the lower spine collapses, the heart drops and the head drifts forward. Then observe how as you rock forward onto the sitting bones, the lower back slips inward, the heart rises, and the head settles in line with the shoulders. The name of the game in boat pose is to keep your weight settled firmly on the base of the pelvis, maintaining a more steady and supportive position of the spine. This action will grow more important as you up the ante by moving into the pose, so be clear about it here when the stakes aren't quite so high. Remember, there's no room for laziness or timidity in boat pose, so dig out your boldness and enthusiasm now. Still holding onto the back thighs and without losing a feeling of spaciousness in your heart, lean your upper body backward until your arms grow nearly straight. As you do this, encourage the vertebrae of your lower back to rise inward and upward, and invite the heart to feel light and vibrant. Drop the shoulder blades away from the ears and position the head in line with the shoulders, avoiding the tendency to jut the chin forward and shorten the back of the neck. Now comes the fun part. Without collapsing the spine or rolling back onto your sacrum, draw your feet a few inches off the ground. Balance steadily and evenly on the base of the pelvis, rise upward through your chest, and remain full and energized through the belly. Breathe steadily, letting the inhalations and exhalations feel full and rhythmic. Enjoy the challenge of this pose, as well as the warmth and invigoration that it brings. After a few breaths, settle the feet back onto the ground, soften your body, and give yourself a few moments to rest and recover. Repeat this variation of boat pose a few times, enjoying the challenge of balancing without sinking, cultivating enthusiasm without creating strain. If this exploration of boat pose leaves you in stormy waters with fatigue in the belly or strain in the lower back, you might like to try a gentler introduction to the pose instead. From dandasana, bend your knees and place your feet on the floor a few feet from your pelvis. Rest your elbows on the floor behind you with the palms down and the hands pressing into the floor next to one another just beneath your sacrum. Root the forearms energetically into the ground to help lift the lower back upward toward the sky and lengthen the spine fully. When you’re sure your belly is rising instead of sinking, lift the feet off the floor a few inches, legs parallel and feet hip-distance apart. After several breaths, release the feet back to the floor. 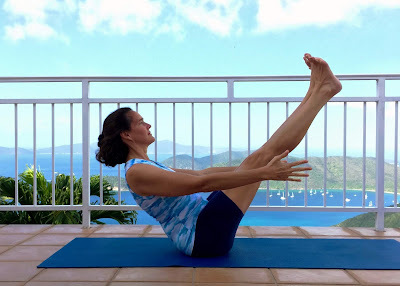 Whichever variation of boat pose you’ve chosen - hands behind the thighs or on the floor behind you - when you’re ready to up the ante, lift the feet farther off the floor and extend the feet away from you until the shins are parallel to the ground. Keep the knees and feet hip-distance apart as you extend brightly through the heels. Lengthen out of the belly and up toward the sky. Resist the tendency to let the demands of the pose to sink your spirit. Don’t throw in the towel. Remember, this pose is helping you cultivate stamina and strength of spirit. Enjoy the challenge! Breathe steadily for several seconds in this posture before settling your feet back onto the ground. As you rest, enjoy the sensations of warmth and invigoration percolating from the core of your body out to your fingers and toes. These introductory versions of boat pose may be enough of a challenge for your belly, back and legs for now. If so, rest onto your back in savasana, or corpse pose, and enjoy the vitality and vigor this exploration has offered. Let the energy you’ve cultivated melt away inner tension, leaving you bright and happy and bold. When you’re ready to move into an even more challenging variation of boat pose, you can repeat a similar exploration with the arms outstretched in front of you. As you lift the feet off the ground and stretch out the legs, reach the hands forward with the palms facing toward one another, arms parallel to the ground. Continue to lift and spread the collarbones while releasing the shoulder blades downward. Reach skyward through the crown of the head, and invite the torso to feel magnetically pulled toward the thighs. Don’t fall backward as you do this. Instead, continue looking optimistically forward and upward. If you must fall out of the pose, insist that you fall forward and not back. Use your strong and steady breath to help you do this. Each time you breathe in, soften the skin, quiet your gaze, and draw your attention inward. Each time you breathe out, energetically extend from the core of your body outward toward your skin. Imagine that you are exhaling outward through your fingers, toes and crown. Let that image fill you with substance and support so you can continue floating in boat pose for just a few more moments. This is a perfect time to consider whether it is possible for you to face the challenge of this pose without letting your spirit sink. Can you embrace difficulty without shrinking, without withdrawing back into the safety of your armored shell? Don’t force the action. Come out of the pose whenever you feel the body sinking into strain, but at the same time remain big and bright in spirit. Let this moment help you cultivate the stamina, strength and substance that will carry you with ease and presence through every joy and challenge that life may ship your way.